The start of a jam. Before the modern game came to life, all major forms of roller derby utilized rolling jam starts. This meant that all players from both teams were made to start rolling around the track at a moderate pace, while in pack formation, before a jam could begin. Once a classic game of roller derby got going, the pack and its players never stopped rolling around the track during general play. Everyone was constantly circulating around the track, even as substitutions were being made between jams. 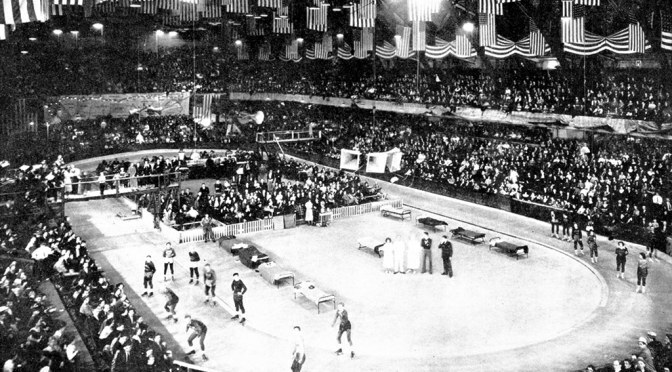 Before the demands of television, they didn’t even stop rolling for the men/women changeover between periods, creating a situation where up to 20 players were on the track at once as teammates “tagged” their partners in, a tradition that dated back to the transcontinental skating marathons. Exchanging positions between jams or periods resembled the controlled chaos of a short track speedskating team relay race. Back then, there were only a few extra players available to skate for a team in a period, so substitutions were light. The only thing that changed during the downtime was the helmets (positions) between players already circulating. For modern derby as it is now, implementing a rolling start would be impractical and chaotic. There would likely be substitution gridlock as players left the track and new players entered it, leaving no definitive nucleus for players to congregate to. It would be more confusing would be worth it for the skaters, referees, and the fans at this moment in derby’s new history. Standing starts can to do the job just fine—or at least, they will once the WFTDA fixes things with their jam start rules. However, there is one aspect of the old start sequence that modern derby would be wise to take a closer look at. Back then, packs were required to line up in equal position between teams before a jam could begin, with the pivots at the front, the blockers in the middle, the jammers at the rear, and both teams pretty much equally distributed throughout the pack. Contrast this with modern derby jam starts. Once a jam ends, blockers participating in the next jam are free to line up within the designated start area without restriction. It’s pretty much first come, first served, with no rules dictating mandatory formation, other than WFTDA flat track rules giving pivots exclusive access to the oft-neglected pivot line. In casual play, this would be fine. However, this take-what-you-can get mentality before a play begins may cause a competitive imbalance if there are two equally-matched teams who will to squeeze every little bit of advantage that they can out of the rules. Many effective roller derby strategies in WFTDA and RDCL play seem to give a team holding the rear of the pack a natural advantage over those holding the front. This has been demonstrated in practice a countless number of times and is not something I need to further pound into the ground here. Even if it were just a perceived advantage instead of an actual one, it’s still something both teams may want to position themselves for. If they believed one location in the pack to be more advantageous than the other, whether that be the back, the front, the inside, the outside, or anywhere else; and both teams wanted to occupy that location at the same time, the only way to make it completely fair to both teams would be to give them both an equal opportunity to claim it before a jam begins. However, the modern game doesn’t allow for this owing to the different positions of team benches relative to the starting lines on the track. A) The classic rolling start. Teams are equally distributed in the pack, giving neither team an advantage (or disadvantage) and ensuring a fair start for both teams. B) In WFTDA play, if both teams want to start with a rear wall, one team will never be able to get it owing to the other team’s bench being closer to the jammer line. C) If WFTDA rules were changed to make the front of the pack advantageous, at least both pivots could be at the front. However, one team would still have a moderate (and unequal) positional advantage with the rest of their blockers. D) With benches in the infield, RDCL banked track play almost eliminates this issue, but there may be situations where bench positioning–not team play–still gives a team a small pre-jam advantage. In an attempt to balance out this discrepancy, it is customary for teams in contemporary play to switch benches at halftime. This gives both squads an equal amount of time on either bench, and therefore making it so they have roughly—but not always—an equal amount of jams nearer both start lines. This doesn’t quite balance things out 50/50, however. Game situations, score differentials and time remaining have a big impact on strategy. Teams aren’t as desperate for points or mindful of clock management in the first half as they are in the second half, for example. In a close game, if a team’s best game-closing strategies require a rear wall completely behind the other team, only one team is ever going to have the chance to get it during second-half crunch time: The team with the bench nearer the jammer line. The fact that the other team got to sit in front of the jammer line during the first half won’t help them at that point in the game. There may be room for improvement. Although the classic rolling jam start is impractical, the element of fairness and equal position within it is a good base to work from. Where do you line up your blockers in relation to the other team’s blockers? Do you keep your team together horizontally for maximum blocking strength, or do you distribute them vertically for more options? Do you put your best blocker at the rear to help your own jammer, or do you put her at the front to act as a last line of defense? Personally, I grew to fall in love with this facet of the rules, because it helps to differentiate the flat-track game from other versions of the sport. However, the subtleties of it got thrown out the window once everyone decided lining up eight-astern on the jammer line was the way to go. This will be fixed at some point in the WFTDA’s rules revision future, obviously. However, a potential solution to it, artificially corralling blockers into a tight starting box as in RDCL banked track rules, may take this bit of strategy away from the game. There is a potential compromise, and we can take an element of the classic formation start rules to discover it. Rules-based formations are not new to sports. In football (gridiron), the team on offense is free to line up in any formation they would like within the rules designated for pre-snap play. That is, seven players must be on the line of scrimmage–no more, no less–only one player in the backfield may be in motion at one time, and any shift in formation must pause for one second before the ball is snapped. This setup allows the offense to show different looks and implement different pre-snap strategies in an attempt to deceive the defense, while at the same time giving the defense a fair chance to defend against surprise pre-play trickery, knowing that the offense is relatively limited in what it can do before the play begins. In roller derby, teams are on offense and defense at the same time. If we were to apply the fairness of the football pre-snap formation to a roller derby pre-jam formation, we can give both teams the opportunity to implement positional strategies against their opponents while at the same time giving both teams a fair chance to position themselves against the other team, regardless of bench positioning. This can be achieved by mandating some blockers line up in a rigid formation, allow other blockers to line up as they please against the other team for strategical purposes. In football, line-of-scrimmage rules bind the offense before a play begins, although they still have flexibility to show different looks within those rules. (Can you imagine what football would be like if formation rules didn’t exist?) Roller derby can implement a similar system, such as requiring the two pivots and a blocker from each team to start on the pivot line by rule (for fairness) but still allow the other four blockers to line up where they please (for strategy). Here are some examples of this hybrid theory. A setup that requires half the pack to line up in a strict formation would ensure a team is never potentially disadvantaged due to an unlucky bench position at the wrong time of the game, because both teams would need to line up at least half of their blockers at the pivot line. This wouldn’t take away from positioning players freely, as they can position their “wide receivers” where they please around the locked-in formation. This could also make blocker and pivot penalties a bit more significant, giving a team fewer formation options to work with at a jam start. Between-jam substitutions would also be made less chaotic, negating most of the need to sprint to a position amongst players and referees letting their guard down as the previous jam ends. Making the game more fan-friendly is another potential benefit of this system. If the referees see that all players are in their starting positions and are ready for play, they can begin the jam right away without needing to wait for the full 30-second jam reset time to wind down. This format could therefore put more action in the game, squeezing more jams into 60 minutes—and giving more derby to the paying fans. 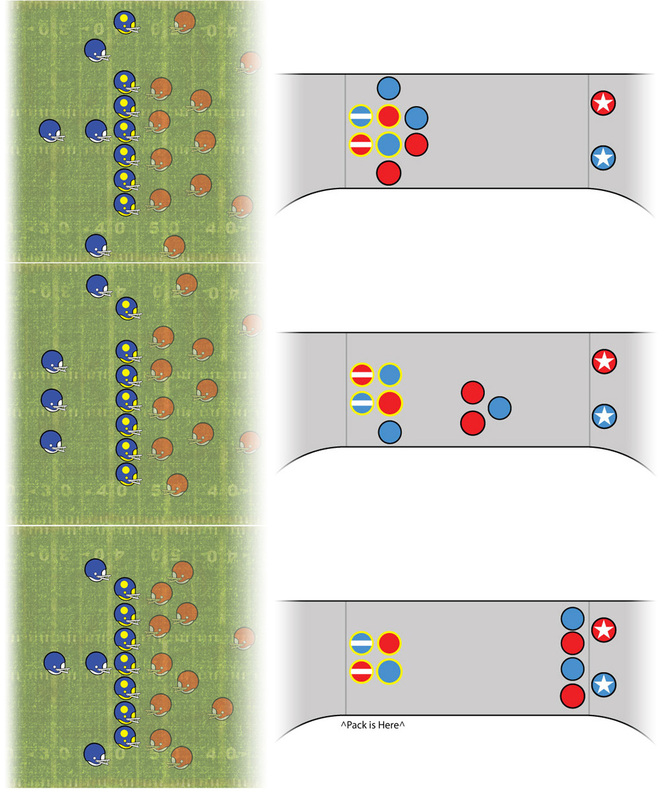 Most importantly, a rule-based jam start formation absolutely guarantees that a team that wants to get a particular position within the pack after the jam starts, must fight for that position by blocking, evading, whipping, and otherwise using teamwork to fight through the other team earn that positioning with effort, not luck out by having a conveniently located bench position. For a team sport to be completely fair, both teams need to start from an equal same base. That’s why basketball tip-offs happen at center court, hockey face-offs are at center ice, a football team has a 50/50 chance to start the game with the ball, and why the score at the beginning of every game is 0-0. No team is closer to an advantage before the game begins and the players are released to do battle with each other. Having a fair start in roller derby is especially critical, considering the nature of the simultaneous offense-defense nature of the sport. The original rules of derby had the fair and equal jam start put into them from its purely legitimate beginnings for this very reason. Both teams having the same opportunity from the get-go is what makes a sports fair and intriguing all the same, and roller derby would do well to have a truly fair and equal start built in to it.